More than 25 years ago, even before he was a watershaper, Jim Wilder came across a fountain puzzle he couldn't solve. Since then, he's figured it out -- and shares his observations of a neat effect here. Water in the open basins that commonly surround fountain jets or nozzles is never tranquil while these systems are in operation. It will slosh around in response to the upward thrust of those jets or nozzles as well as the splashing the rising water makes as it drops back into the basin. If the circumstances are right, this disruptive splashing will produce waves in a distinct, consistent pattern. By exploiting these waves, it’s possible to produce an effect I find fascinating. I first became aware of this phenomenon well before I was involved in watershaping as a profession. My wife and I were traveling in India, and there was a garden with a large fountain in an ashram where we were staying. The reservoir was a 60-foot square filled to a depth of, I’m guessing, three or four feet. In the middle of the reservoir was a single fountain head, the orifice of which was set just below the water’s resting level. As I watched, the water would shoot about 40 feet in the air, then after about two seconds, would be shooting up no more than a couple feet. Then, seconds later, it would jump back up to 40 feet. In a meditative mood, I wondered: How are they doing that? Before long, I was intrigued enough that I sought out the fellow who maintained the system. He was nice enough to show me the equipment room, where I saw an effect pump alongside a smaller pump that powered the circulation/filtration system. There was no valving or any other form of control system that could explain the way the fountain acted. When I asked the gentleman how it worked, he let me know that hadn’t a clue: It just worked. I’m a person with a curious mind, so this was clearly not enough information to satisfy me. I went back to the fountain and sat there and watched. I’m not a hydraulic engineer, but it wasn’t long before I developed a working theory for the system’s fluctuating performance. I noticed that the water, agitated by the extent to which the jet disturbed the surface on its way through the water and up into the air, would slosh out to the side in a radiating pattern. At times, troughs in the wave action would eliminate the water column just above the head, leaving the jet free to climb into the air unimpeded. Then the situation would reverse itself, with the sloshing burying the nozzle under so much water that it interfered with the jet action and lowered the plume considerably. In due time, I noticed that the wave/sloshing action was dependent on the concentric waves reflecting off the reservoir’s walls and flowing back toward the nozzle. This was all happening in a basin in which the water was extremely agitated by the power of the jet. In fact, my estimate is that the level at the center of the reservoir would rise and fall by about a foot. When the jet was buried under a blanket of water, it fought its way up to a very low level. When the cycle reversed itself and there was no water over the nozzle, it would blast its way up to its full potential. At the time, I didn’t have the vocabulary I needed to describe what I was seeing in the ashram’s fountain. Only later did I learn that I had been observing what is known as water-level dependency. My only regret is that I didn’t have a video camera with me back then: This isn’t an easy concept to describe in words, and a film clip would work wonders! For the past 30 years, I have seen a large number of fountains where this effect works either well, not so well or not at all – observations that have led me to refine my sense of what it takes to produce the effect deliberately rather than accidentally. To this day, I have no idea whether the ashram’s fountain had been set up to act the way it did, but I prefer to think that whoever put it together knew exactly how to generate the fluctuations: That would have been incredibly cool! Second, experience tells me this only happens with water-level-dependent fountain heads – that is, heads that make it possible for the effect to occur as the water level fluctuates. A bubbler head is probably the most obvious candidate: As the water level changes in the reservoir, the thickness of water above the head’s orifice also changes: Less water above the head means less vertical resistance, allowing the water to shoot higher, while a thick layer above the head impedes the flow and makes it drop to a significantly lowered level. Third, there must be enough freeboard in the reservoir to make the wall surface tall enough for rebounding: If there isn’t enough of this surface, the water will lose energy by sloshing right out of the reservoir. There’s also a fourth factor, although I can’t quantify it with any sort of certainty. At this point, I can only assume that there is some minimum required water depth in the reservoir. I haven’t tested this concept, but I believe that shallow water would create enough drag on the wave movement through the reservoir that regular periodicity wouldn’t develop the way it seems to in deeper water. All of this information is fresh in my mind: Just recently, I installed a new fountain on the campus of Los Medanos Community College in Pittsburg, Calif. Walking around, I came across two existing fountains, and both were exhibiting the sort of sloshing that had caught my eye in India so many years before. To me, the effect was satisfying in one of the fountains and made it more interesting; in the other, however, I thought the sloshing detracted from the fountain’s appearance instead of enhancing its beauty and appeal. 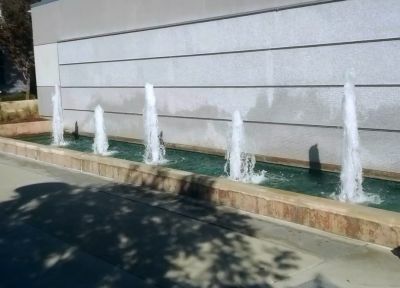 As someone who has observed this effect on several occasions during the past 30 years, I have to believe that this is something that others have noticed – and that these fountain effects aren’t accidental. For one thing, this would explain the fact that fountain suppliers sell wave dampeners to minimize water-level fluctuations over fountain heads. For another, I have to believe that this enough of a known quantity that good fountain designers have been exploiting the sloshing, thereby producing effects with abiding visual appeal. When it works, this effect truly is special: It brings a consistent pattern and variety to a simple fountain system without a great investment; it also lends these spaces an air of mystery, making curious observers like me wonder how in the world the effect is achieved. Try it: You’ll like the result. Jim Wilder is founder and owner of Living Water Creations, a Santa Rosa, Calif., design and construction firm focused on custom waterfeatures for both residential and commercial clients. He is also founder and owner of Pond & Fountain Pros, a pond and fountain supply firm also based in Santa Rosa. A 1975 graduate with a degree in geophysics from Sonoma State University (Rohnert Park, Calif.),Wilder began his working life in engineering and geophysics before shifting to watershaping on a full-time basis more than 25 years ago. In his spare time, he is an accomplished three-cushion billiards player. Great article but you give fountain designers way too much credit. Most of these instances are totally by mistake as designers fail to understand the reason that water level dependent nozzles create this wave action. Any nozzle that is placed at or below the water level imparts energy into the water. Some, such as bubblers push though 3-4" of water while others like cascade or geyser jets have a barrel over the outlet that introduces water to the effect though a venturi action. The energy imparted to the water manifests itself in wave motion as you noted. As those waves move to the perimeter of the concentrically shaped pools they reflect off of the walls and tend to get in sequence with each other and amplify the wave effect to the point that the full oscillation starts to occur. In round pools the oscillation is concentric and in rectangular pools the oscillation is often asymmetric or from corner to corner. As for the pool walls, if you plan on this effect, the pool coping should hang over the interior wall enough that it reflects the splashing back into the pool rather than letting it slosh over. The problems created by this oscillating effect have to do with constantly sloshing water into the overflow device and swamping and starving the skimmers (if used). Additionally the wave motion as it moves past the water level control constantly is making the fill valve cycle on and off. If there is a low water sensor as part of the control device the wave can often cycle the pump on and off. Most of the fountains I have come across that have this phenomenon have the fill valve disconnected and are manually filled. This of course is in addition to losing water over the pool wall and getting water blown out of the pool when the effects jumps up to a height way beyond the design point. As you noted, circular wave baffles around the jets can help cancel the effect as they disrupt the energy and do not let the first wave form. They only have to be mounted to just below the water level to be effective. If the water level is sufficient to mount the jet and its required submergence, it is usually sufficient to get this effect going.